Write a C program to read elements in a matrix and find the sum of elements of each row and columns of matrix. C program to calculate sum of rows and columns of matrix. 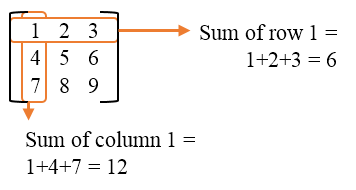 Logic to find sum of each row and columns of a matrix in C programming. Program to find sum of main diagonal elements. Program to find sum of opposite diagonal elements. Array and Matrix programming exercises index. C program to find sum of upper triangular matrix. C program to find transpose of a matrix. C program to find determinant of a matrix. C program to check whether two matrices are equal or not. C program to check Identity matrix.